In the wake of the recent upsurge in terrorist attacks, hareidi volunteers for the first time join the ranks of operative policemen. In the wake of the recent upsurge in Palestinian terrorist attacks, hareidi-religious volunteers will now, for the first time, join the ranks of operative policemen, prison service officials, and firemen. The initiative is that of Sar-Shalom Jerby, Director-General of the Civil/National Service Authority, together with Police Minister Yitzhak Aharonovitch and Police Commissioner Yochanan Danino. Fourteen hareidi-religious volunteers enlisted in the first special security course, including service in the police, prisons, and fire-fighting departments. 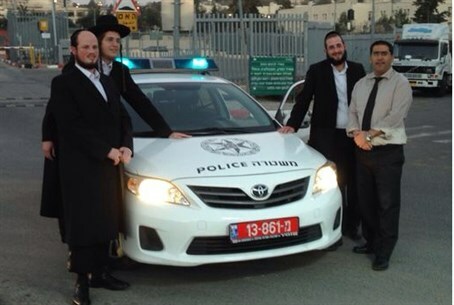 The 14 have already been integrated into the reinforced police array around Jerusalem and along the Green Line. They participated in a four-month course with special arrangements for hareidi participants, such as only male instructors and extra-stringently kosher food. There is room for over 3,000 new recruits, most of them in the police force. They are to serve four weekly shifts of nine hours each, for two years. "This is a significant breakthrough in the process of integrating the hareidi sector in operative security positions," Jerby said, adding that this was an important goal and "we are working to increase their numbers."